Our super formula for Nitrogen Booster in convenient capsules. That is a product for every serious athlete looking to improve their results with each and every workout. BULEX CORE ® capsules - an incredible pre-workout product that gives you strength, energy and endurance. Extremely potent. You'll no longer have an excuse for skipping a workout. Each pack contains 24 servings – an exceptional product at a great price! It contains all necessary amino acids to help you pump up your muscles and bend iron in the gym. The energy complex with natural guarana caffeine keeps you toned and fresh throughout the workout. Their ratio has been especially selected and they do not cause “crash" effect. We have also added Creatine HCL monohydrate and micronized monohydrate for you to have all the power you need from the first minute of your workout until its very end! DIRECTIONS OF USE: Provides more strength, energy and endurance before workout. 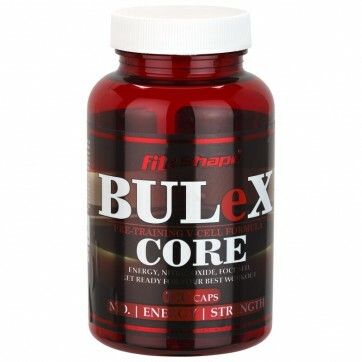 Enhances protein synthesis and lean muscle mass gain. Speeds up recovery after exercise. On workout days, take one serving of five capsules before workout. On non-workout days, take one serving of five capsules in the morning or before noon, 15 min before meals. 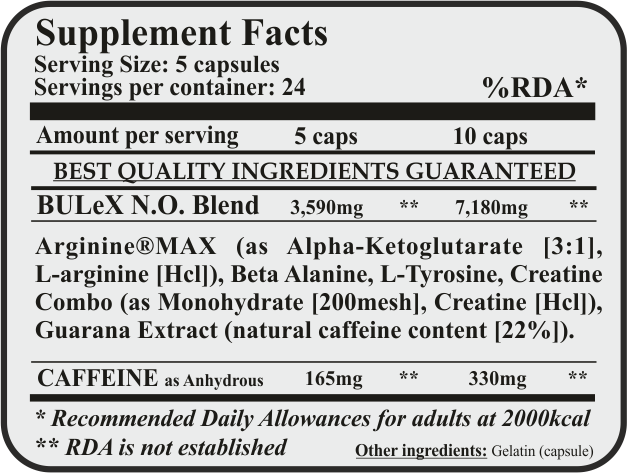 INGREDIENTS: Arginine AKG, arginine HCL, beta alanine, L-tyrosine, creatine monohydrate, creatine HCL, guarana extract, caffeine anhydrate, hard gelatin capsule.